They contemplated enemy invasion every day and carried their gas masks at all times, recalled a worker in the underground Churchill War Rooms in London. 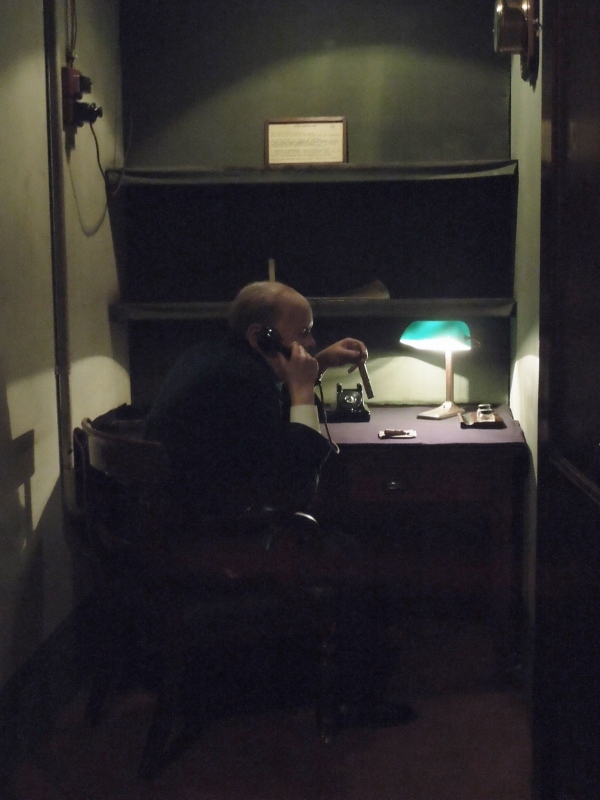 A broom closet in these Cabinet War Rooms was converted into the Transatlantic Telephone Room, where a phone, connected to a scrambler at another London location, could call the White House. It was the first hotline. Prime Minister Winston Churchill and his generals spoke to President Franklin Roosevelt and American generals. You hear a recording from this hotline, Churchill and Roosevelt discussing an offer of surrender from one of the nations they were fighting. (Only one nation offered, and that was the problem.) I was fascinated to listen to their familiar voices reach a decision together and it made me think of the dark days of the war. What if they hadn’t had this secure phone connection? Only the highest-ranking personnel, like generals, had a tiny bedroom/office instead of a bunk in the dock. Others lived at home. Many men and women slept on bunks in the sub-basement, which they called the dock. The ceiling was so low that nobody could stand up straight as they walked, and it was brightly lit, with noisy ventilation, all night long. A corridor has chests with large, flat drawers; I think they contained hundreds of maps. 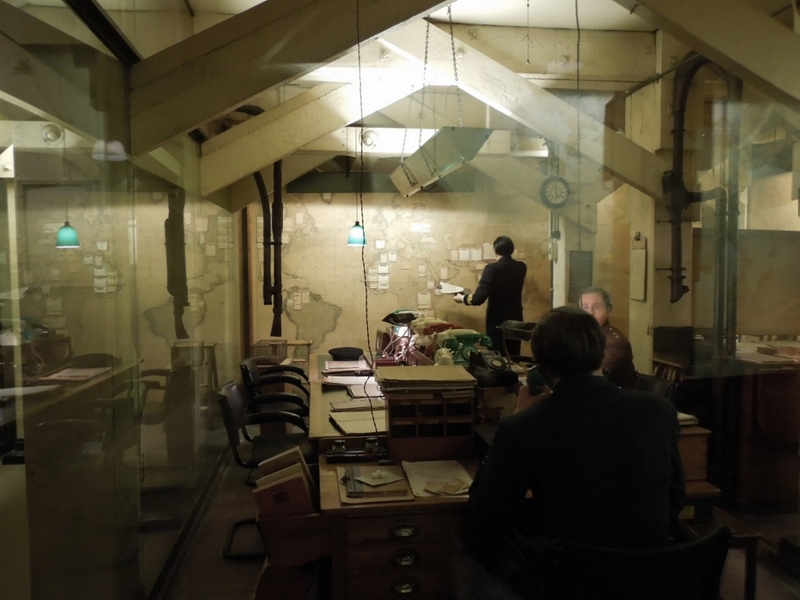 The Central Map Room, show below, is a highlight of the war rooms. The large map at the far end was used to track convoys, Allied fleets that carried ships full of men and materiel and were sometimes destroyed and sunk. 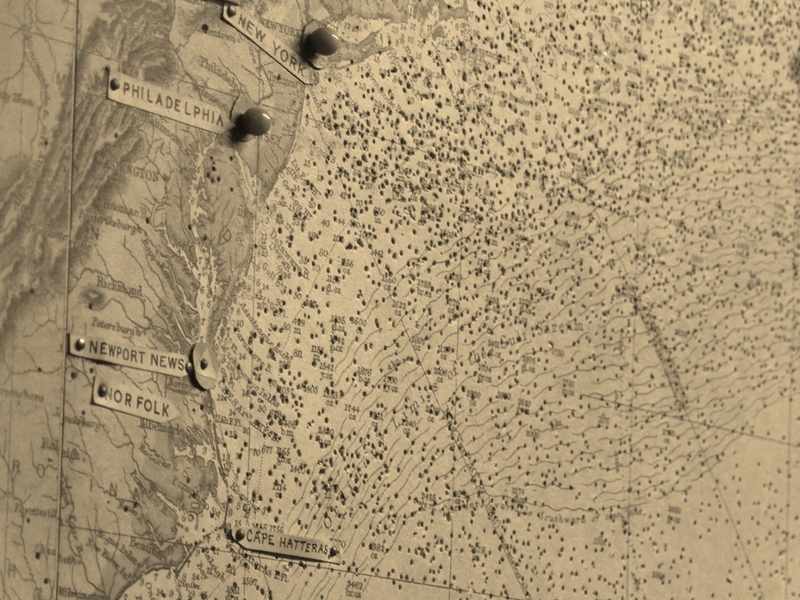 Below, a detail of this map, showing the east coast of the U.S.
Each pinhole was the location of a convoy. This is part of the map above, used every day of the war. 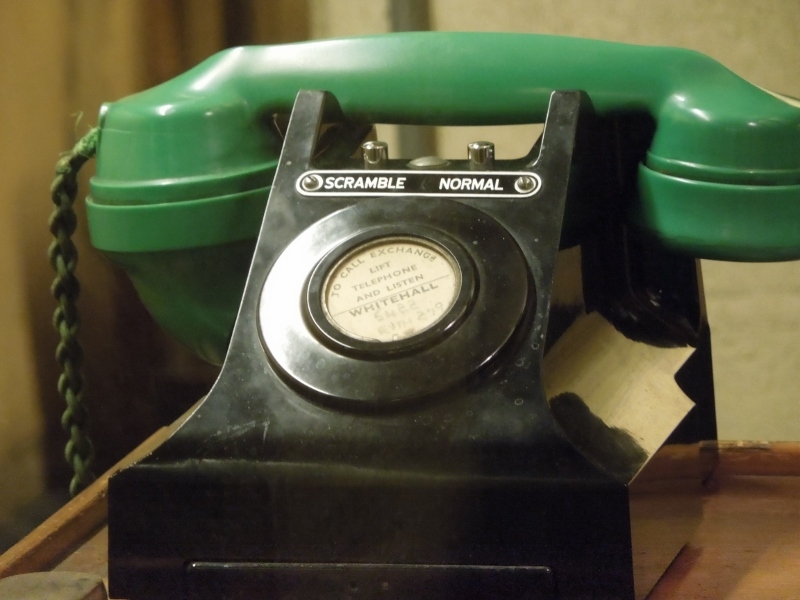 Telephones with a green receiver have a scramble button for classified conversations. The officers who worked in the Central Map Room gathered data and delivered daily reports on every front to an office above ground. This room was staffed 24/7 until the lights were turned off the day after the war ended in Asia, and the room is the same today. 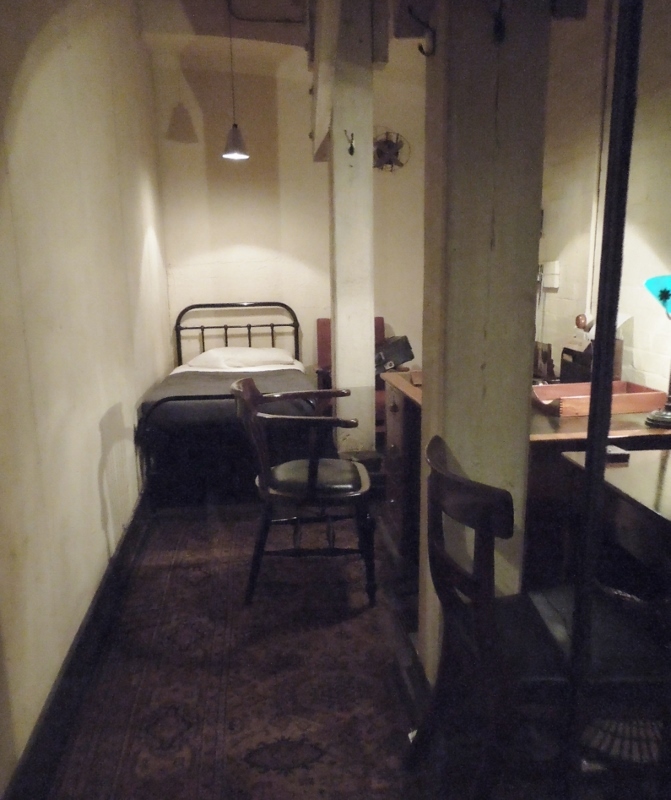 I hope you enjoyed these two posts about London’s Churchill War Rooms, also called Cabinet War Rooms. I sure enjoyed my visit, and I wished I’d left time for the attached Churchill Museum. Wonderful. Are those Mme. Tussaud’s figures? I saw them used to “enhance” Warwick Castle and didn’t think they achieved that goal. However, it looks like they work here very well. Wow, those figures look real on my phone. Their faces don’t look real at all but they look natural sitting and standing, so they look good in photos. The Churchill one adds a lot to the tiny transatlantic phone room, especially with that cigar.